« Flavor: Using my math powers for evil. 1. What mathematical activities? What level of rigor? In research, I’ve done computations at various times, for various reasons. One is to collect empirical data, on which to base conjectures. Another is for the sake of building intuition about “what’s going on.” A third is in order to construct an object with certain properties. I think most mathematicians do computations almost every day, but, in my experience and from what my advisor has told me, there are also week- or month-long periods of computing. This post will be based mainly on the four-month period in the winter of 2011, when I was constructing a certain mathematical object. Starting from the way certain homology computations proceed, my goal was to construct an object (in the derived category of a non-Noetherian ring) with certain “nice” properties (periodic homology of certain types). It was a constant back-and-forth between tweaking my object’s construction and computing its properties. Once I got a sense of how the subtleties of the object affected its properties, I could actually build a family of different objects, with a range of nice properties. There was a small amount of intuitive imagining – thinking of how I might tweak my construction to get it to do what I wanted. But every small new idea required hours of computations, to see the consequences. So the majority of my time was locked into completely rigorous symbol manipulation. Maybe this step-by-step, completely explicit computing is the most rigorous math experience I know. 2. What relevant interactions with other mathematicians? Every mathematician carries a tool box of problem solving techniques; each tool has a range of applicability, and each subfield has some common tools and some less common ones. For example, my computations in winter 2011 involved using spectral sequences, one of the most elaborate computational tools in algebra. It was crucial to meet with my advisor, at least once a week. I would often get stuck or make mistakes while trying to use a spectral sequence to compute (the homology of my chain complex). There were lots of tiny, explicit steps, and we could quickly locate the issue and work past it together. But perhaps more importantly, my advisor, an experienced computation-doer, would suggest new tools I didn’t know or didn’t think of. 3. How does it feel, what is the mood? Doing computations can be fun and satisfying; I think most mathematicians would admit to getting some pleasure out of a long page of scribbled symbols that results in some final correct answer; I think most people, in middle school or high school, experienced this satisfaction. 4. What state of mind? stable vs. chaotic? focused vs. dispersed? The cognitive strain of doing computations is less than other modes of math, perhaps because the symbols take the concepts out of my head and map them across a whiteboard or chalkboard. My thoughts were closely represented by the string of symbols I wrote, and these were explicit, stable, and linear for the most part. Using the board as an extension of my mind, I could zoom in on any circle of ideas and clarify to any scale I wanted. When I was working, it felt like the board and my knowledge were two manifestations of the same thing – an exotic landscape of intricately connected concept-symbols, only a subset of which were present at any given time. Each concept-symbol is just a signifier of other relationships with other concept-symbols, in deeper and deeper nested layers. Since my work was so contingent on this physical representation, it was easy to turn on and off. To start working, I simply had to set myself up in front of a board or pad of paper, and start writing things out. To stop, I just had to pack up and leave. Outside of these work periods, I only rarely would ponder, in a more dispersed mode – where was this headed? what should I try next? 5. What type of self-reflection during the experience, and did it help? But I’ve always scorned the idea that math should have applications outside of math, are applications within math any different? Wasn’t this math at its purest, math for math’s sake, building nice math because I could? Why did the experience feel so unsatisfying? I like plants more than animals, shape more than color, form more than function, cosmic gestures more than emotions. These math objects didn’t appeal to my aesthetics; I didn’t think they were “nice,” only “neat.” They were too specific; I felt stuck deep in mud. Recognizing this as the cause of my lack of enthusiasm, I was able to shift my perspective. On the one hand, I was able to appreciate the specificity of these constructions, and stop worrying about their meaninglessness. I embraced the game of symbols as a game, and one that I was getting better and better at. On the other hand, I found the cosmic gesture within the mud, as it were. 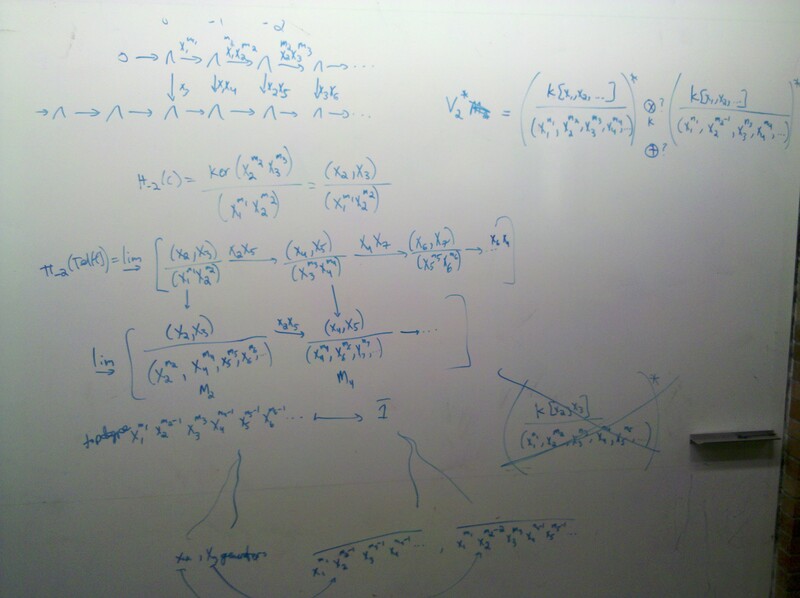 Within the experience of computing homology groups at the whiteboard, I identified a resolution to the mind-body paradox. During that experience, the maps of symbols I wrote on the board were the maps of concepts I experienced in my mind, and vice versa. Approaching my work from this angle, I found renewed enthusiasm and depth. 6. An everyday metaphor for the experience? Doing computations is like playing a game. The rules are explicit, undebatable, and somewhat arbitrary. 7. An example of a good day and a bad day? On a good day, I might fill a whiteboard several times with scribbles, occasionally writing down fruitful computations in my notebook. On a bad day, I’d get royally stuck, or find a mistake and have to backtrack, or just not have fun. 8. What did you do when you were stuck? Most sticking points had to do with small mistakes, which I could hunt down on my own, or misapplications of various computational tools, which I could easily ask my advisor about. 9. When and why did it end? I stopped when I had succeeded in constructing a family of objects with sufficiently nice properties. I found one application of these computations, answering an open problem in the field. This seemed like a good stopping point. There were more directions I could’ve gone in, but didn’t feel like it. This entry was posted on August 24, 2011 at 4:43 pm and is filed under seasons. You can follow any responses to this entry through the RSS 2.0 feed. You can leave a response, or trackback from your own site.